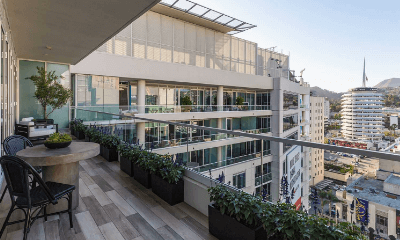 W Hollywood Residences is a twelve-story, high-rise luxury condo building connected to the W Hotel right in the heart of Hollywood, CA. The property sits near the world-famous intersection of Hollywood & Vine. Condo units in the building have exceptional views of Hollywood Hills, Downtown Los Angeles, San Gabriel Mountains, and the Pacific Ocean. The W Residences is located in one of the few areas of Los Angeles where one can have a true metropolitan lifestyle with excitement and buzz all around. View all W Condos for sale below or scroll down for more neighborhood information. Register for a free account so that you can receive email alerts whenever new W Condos come on the market. The W was completed in 2009 and is the anchor building of Hollywood's recent rejuvenation that began with approval of the $922M Hollywood Redevelopment plan from the early 2000s. Residential, retail, and hotel construction nearby has been on torrid pace ever since. Living in a W Condo means less car dependence because Hollywood is incredibly pedestrian friendly. Daily errands are handled with a quick jaunt to Trader Joe's (same block) or the Hollywood Farmers Market on Sundays. If you need to travel a little farther from the neighborhood, you'll be pleased to know that W Hollywood Residences sits atop the Metro Red Line station. So, if you're not in the mood to deal with traffic (who is? ), it'll be very easy to take the elevator to the lobby and hop on a subway. Your daily work commute will never be easier. What's more, you can make your way to DTLA any night of the week for dinner, drinks, and an evening with the L.A. Philharmonic. Though, there's plenty to do near home. Hollywood has a wide variety of restaurants, cafes, and old school Hollywood watering holes. Nightlife here is pretty hot on the weekends, and there's never a shortage of entertainment and live music. Do you like live theater and plays? Hollywood Pantages Theatre is right across the street from W! Penthouse residents enjoy extra privileges such as a Starwood Preferred Platinum membership, private concierge, and additional parking spaces.